In Rails 3.1 the controller inheritance also applies to the view layer. Here I show how to add an application template which is shared by all views, and a lookup path for overriding templates based on the subdomain. One of the new features in Rails 3.1 is template inheritance. This feature won’t revolutionize the way you write your views, but it’s a useful new feature to have and in this episode we’ll show you how it works. For the purposes of this episode we have an application with the same navigation on each page. The navigation is currently defined in the application layout file within a div element with an id of side and is static. We want to customize the navigation so that it changes depending on the current controller. There are a number of ways that we can do this but we’re going to use template inheritance. To do this we’ll first move the navigation out into a partial that called “side”. Where should we put this new partial so that it’s accessible from every controller in our application? We could create a directory called shared under the views directory and put it there or we could place it under the layouts directory but in Rails 3.1 we can put it in an application directory under the views directory. This directory doesn’t exist by default in a Rails 3.1 application so we’ll have to create it. This side partial is now available to all of the controllers as the view inheritance works in parallel with the controller inheritance. All controllers inherit from ApplicationController so all templates will be inherited from the application directory. If we load one of our application’s pages now the navigation works as before. We now have a partial that we can easily override in any of our application’s controllers. All we have to do is create a _side.html.erb partial file in another controller’s views directory. We’ll do this now for ProductsController, creating a partial here that has an additional link. If we reload any page under the ProductsController now we’ll see this new link. Viewing a page under any other controller will still show us the default navigation. We now have a standard location where we can place templates that will be shared across controllers and we can override any of these templates by creating a template with the same name in the appropriate controller’s views directory. This approach works across deep-nested controllers too. Our application has several controllers under an Admin namespace, all of which inherit from BaseController. We can override templates in this Base view, too. If we click the “Manage Products” link in the page above we’ll be taken to the /admin/products page and the navigation will return to the default. What should we do if we want to override the navigation for all of the admin pages? Under the /app/views/admin directory we have a base directory. We can place templates in here and they will automatically be inherited by the other controllers. We’ll do so now and add another link there to distinguish this template from the other side templates. 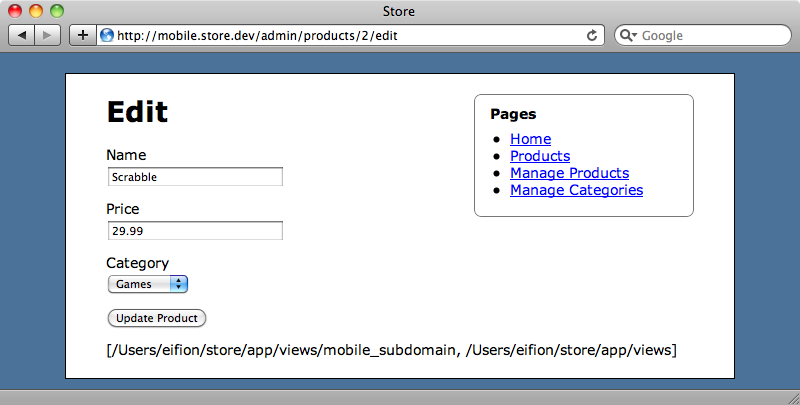 If we reload the admin/products page now we’ll see the template from the base directory template applied. This template will now be shown for any page in the Admin namespace as all of these pages inherit from the Admin namespace’s BaseController. Template inheritance doesn’t just work for partials but for any view template. In the app/views/admin folder there is an edit.html.erb template in both the categories and products directories. Both of these contain the same code. If we move one of these templates up into the base directory and remove the other both controllers will inherit the template from there. Both pages will still work as they did before. This is a really useful feature to have if we are creating a lot of administration pages for an application. These pages often have a lot of repetition in the views and by using this technique we can abstract these templates out into a base controller and override them when necessary in specific controllers. While we’re on the topic of overriding templates we’ll show you another trick that lets you customize templates based on parameters other than the controller. Let’s say that we want to provide a mobile version of the site under a mobile subdomain. We can change the views that are used depending on the subdomain by using view lookup paths. This feature isn’t new to Rails 3.1 and works in Rails 2 as well but as it fits in well with the rest of this topic we’ve included it here. We have something called view paths in our application’s controllers. If we call controller.view_paths in a view we can see what that controller’s view paths are. This controller has one view path by default but we can add more. A good way to add one is by using a before_filter in our ApplicationController. In the before_filter’s method we use prepend_view_path to add a new view path based on the request’s subdomain, if a subdomain is present. We can see this new view path by reloading the page again. We now have the mobile subdomain listed in the view_paths. If we remove the mobile subdomain from the URL above and reload the page it will disappear. We can use this to customize views depending on the current subdomain. If we create a new directory under views called mobile_subdomain we can add view templates there that will override the equivalent default templates. We’ll create a new index.html.erb template under a new products directory here and this template will only be used on this page when it’s viewed under the mobile subdomain. If we view this page without the subdomain we’ll see the default version. When we add the mobile subdomain though our new template is used as the default one is overridden. That’s it for this episode on overriding templates, whether it’s done through inheritance or through the view lookup path. Both of these offer a lot of customization and ways to abstract out views and override them. If you need even more customization of views you can make a view resolver but that’s something for a future episode.